The grilled chicken fast food sandwich has pretty much always been the afterthought “healthy item” on menus since they started appearing on all the major chains in the early 90’s. It’s the kind of thing you’d order if all of your friends were heading to a place and you were on a diet, or if you were on a long road trip and wanted to keep your driving pace but still eat healthy. In other words, it was never anything special. Pretty much every chain offered one, and they were always exactly the same: Bun, Chicken Breast, Tomato, Lettuce & Mayo. Healthy? I suppose, but boring and bland as all get out. This stayed the course until the mid-2000’s when pretty much every food chain decided to make a “specialty” grilled chicken sandwich … which inevitably was to add bacon and cheese, upping the calorie count to the point of “why bother eating healthy?” Kinda like those folks that get a salad but then add 2 cups of ranch dressing. Point I’m trying to make is that you could choose to eat something healthy or something that tasted good; there was no middle ground. Folks, that game has changed. 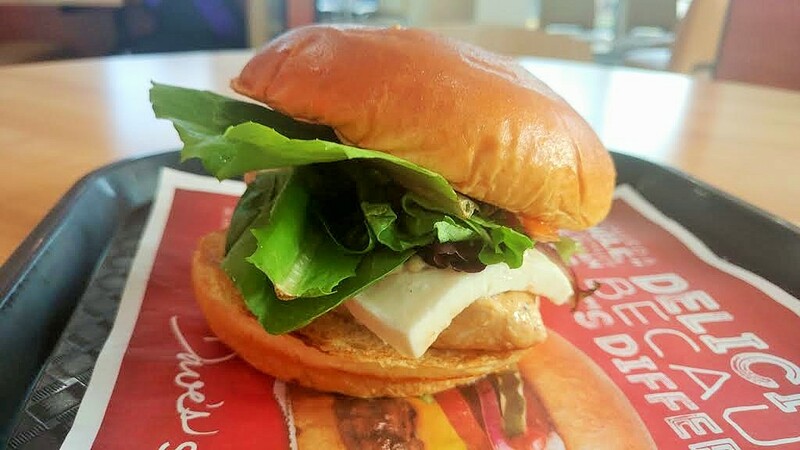 This new Fresh Mozzarella Chicken Sandwich at Wendy’s is not only the best grilled chicken sandwich of the major fast food chains, it is currently, in my opinion, the best chicken sandwich out there right now, even above Chick-fil-A, and I love that peanut fried little buddy. Wendy’s site states that the chicken is topped with 3 slices of fresh mozzarella cheese, a lettuce spring mix, diced tomatoes drenched in balsamic vinegar, and then topped with a creamy basil pesto. Hmm, fresh mozzarella, tomatoes, basil and balsamic vinegar. Where have I seen those combined before? That’s right, kids: There is a freaking Caprese Salad on top of this grilled chicken sandwich, and it does wonders for it.Best part? This sammie clocks in at only 420 calories & 14 grams fat – actually on the lighter end of the above grilled chicken “plain Jane” iterations. Fun fact: My editor asked that I take “landscape” pictures from now on, and rather than letting him know I’d already taken “portrait” pictures, I just went back to get another one. Oh, and I also found out that if you’re trying to cut down on your fat intake, you can substitute a sour cream & chive potato for your fries at no additional charge. Right now, Wendy’s is saying this is a limited time offer. I truly hope this isn’t the case. Chick-fil-A invented the chicken sandwich. Wendy’s has reinvented the grilled chicken sandwich, and hopefully, for good.